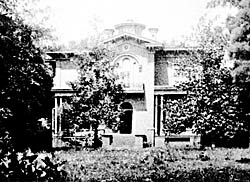 Montfort Hall is one of the few grand mansions surviving from Raleigh’s pre-Civil War era. Built in 1858 for William Montfort Boylan (1822-1899), the house was designed in the Italianate style, with classical influences displayed in its detailing, symmetry of exterior composition and interior center hall plan. The centerpiece of the house’s interior is its magnificent rotunda supported by four Corinthian columns, lit from above by a stained glass window mounted in the polygonal cupola on the roof. William Montfort Boylan was the youngest son of William Boylan (1777-1861), one of Raleigh’s leading editors, landowners and businessmen. In 1818, the elder Boylan purchased Wakefield plantation, former home of Joel Lane, where Boylan’s son William was born. The senior Boylan also owned plantations in neighboring Johnston and Chatham counties and in Mississippi. These, along with his lucrative businesses, made him one of the wealthiest men in North Carolina. In 1855, Boylan deeded his son William 100 acres on the west side of Raleigh. Three years later, William Montfort Boylan engaged William Percival to design his residence. Reportedly a retired British army officer, Percival resided in Raleigh for two years, during that short time receiving commissions for renovations to the Capitol, the First Baptist Church and two other Italianate brick mansions (neither survives). Percival’s other notable North Carolina commissions include New East and New West dormitories at the University of North Carolina in Chapel Hill, and Calvary Episcopal Church and the Barracks, a private residence, located in Tarboro. William Montfort Boylan died in 1899. In 1907, the land around Montfort Hall was sold and subdivided as Boylan Heights, one of the city’s first planned suburban neighborhoods. Montfort Hall subsequently passed through a succession of owners. Despite the addition of a wrap-around porch and frame additions early in the 20th century, the building retained much of its original character. New owners in the 1980s returned the exterior of the building to its original appearance. 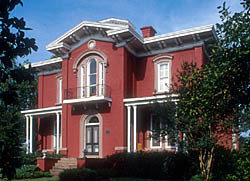 Montfort Hall, a Raleigh Historic Landmark, is located at 308 South Boylan Ave. in the Boylan Heights Historic District (it is also listed individually in the National Register as Montford (sic.) Hall). It is a private residence and is not open to the public.